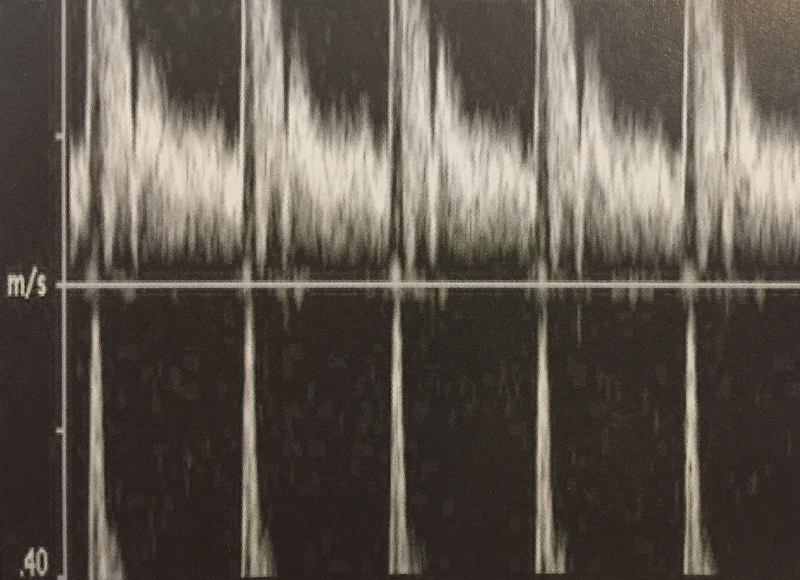 Most sonographers encounter aliasing with pulse spectral Doppler or color Doppler. 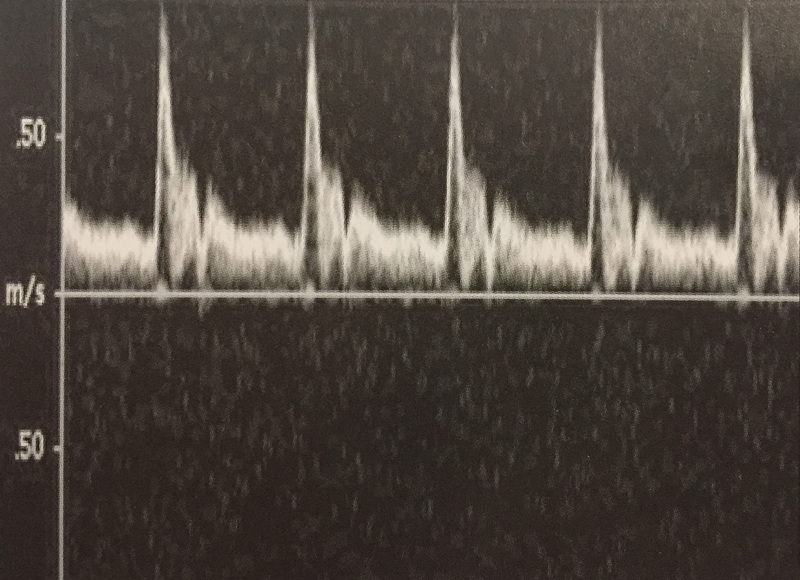 Pulsed ultrasound doesn’t have a particular upper limit for displaying the Doppler shift. It’s commonly known as the Nyquist limit. 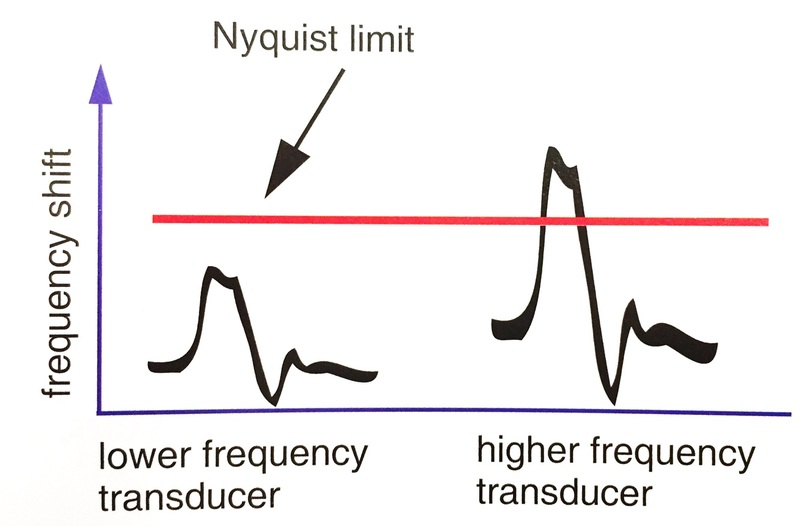 High-velocity blood circulation causes Doppler shifts beyond the Nyquist limit resulting in aliasing. Often, aliasing is visible as a bright and turbulent flow in colored Doppler. How Adjusting Scale to its Maximum Reduces Aliasing? Under some circumstances, the system creates pulses at less than its maximum allowable rate – in other words, the PRF is not maximized. When the sonographer adjusts the scale to its maximum, the system’s PRF is also is increased to its maximum. When the PRF is increased, so is the Nyquist limit. The disadvantage of this method is that higher pulse repetition frequency reduces sensitivity to low velocities. It also does not work with very high frequency velocities as the aliasing artifact will persist. Selecting a lower frequency transducer to avoid aliasing. Doppler shift is directly related to the frequency of the transducer. When measured in hertz, at the same velocity, lower Doppler shifts occur with lower frequency transducers (see image). In other words, lower frequency sound reduces the height of the Doppler spectrum. Lower shifts are less likely to exceed the Nyquist limit (or speed limit) and therefore are less likely to alias. There are not considerable disadvantages of this method during a Doppler-only examination. However, during complex real-time imaging, lower frequency sound produces a lower quality anatomic image. Have you avoided aliasing by adjusting the scale to its maximum? Share your experiences with us.